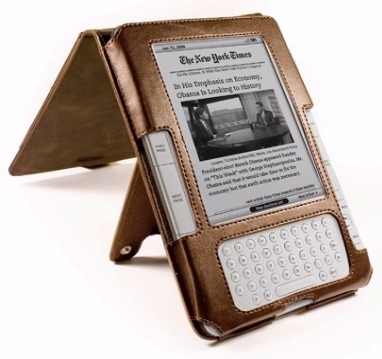 Send Web Pages to Your Kindle! You’ve found an interesting web page, and you want to read it on your Kindle. There’s been tricks in the past that could make that happen — but Amazon’s just relased their own slick, official solution. Now any web site on the internet can just add a “Send to Kindle” icon right to their pages. Clicking that icon brings up a window with a preview of the article, along with a big yellow “Send” button that will deliver it straight to your Kindle! You can try out the new icons on the web pages at Time magazine’s site (Time.com). But that’s just the beginning, because Amazon’s also created some other fun ways to send web pages to your Kindle, as well as documents off your own hard drive, and even documents on your smartphone! So even if a web site hasn’t included “Send to Kindle” icons, Amazon’s also offering some other options. Amazon’s collected them all together into a special “Send To Kindle” web page. The best thing about the browser extension is it’s easy to use. It just puts a cute little “K” icon to the right of the search window, and you click that to bring up a window which will either send or preview the web page first. If you have more than one Kindle, Amazon gives you checkboxes where you can select which Kindles should receive the web page. And there’s even a checkbox to select whether you also want the web page to be stored in your Kindle’s “Archive” collection. But Amazon has more some fun options, if you want to send your Kindle even more things to read. Their “Send To Kindle” web page reminds you that it’s always been possible to e-mail a document to your Kindle, just by finding its e-mail address as Amazon.com/MYK. Even PDF files and Microsoft Word documents will be converted into a Kindle-friendly format. (I had a lot of fun sending cute pictures of my dog to the Kindle, just to see how he’d look when the pictures were converted into black and white.) And Amazon’s even got a way to send documents to your Kindle from your smartphone or tablet! As long as it’s running the Android operating system, Amazon’s app can convert those documents into a Kindle-ready format and deliver them to your Kindle’s home page. You don’t even need a Kindle to read the documents, since you can also pull them up on your Kindle App. I was disappointed that “Send to App” wasn’t one of the choices that Amazon gave me in the settings for their Send-To browser extension. But if you select the checkbox that stores the article in your Kindle’s “Archive” collection, it should still be accessible from the Kindle Apps. And on their web page, Amazon makes a point of reminding users that you can even use Kindle apps on an iPad, an iPhone, or an iPod Touch. “Reading your documents and web content on Kindle is now easier than ever,” Amazon brags at the top of their web page, and they’ve come up with a catchy four-word slogan that sums it all up. An Update on the Kindle Phone!